Like wine, Orson Welles became more respected and rare over time. After his initial foray in Hollywood, he found it increasingly harder to finance his films. Hollywood only beckoned in need of his services as an actor, not a director. Welles’s persona, with his unique baritone voice, rotund body and expressive wide eyes, was known to avid moviegoers and couch potatoes the world over. Welles, the director, remained elusive. Even when his films found financing and distribution, it was like finding a diamond in the rough. Falstaff/ Chimes at Midnight was such a film. In the words of Pauline Kael, “Orson Welles’s Falstaff came and went so fast there was hardly time to tell people about it, but it should be back (it should be around forever) and it should be seen.” Chimes at Midnight is back on the screen giving moviegoers and couch potatoes alike a second chance for viewing. Forty-seven years after it was first produced, Orson Welles’ Shakespearean homage has been given a 4k resolution update by Janus Films and is being shown in select theaters in New York City and Los Angeles with a tour to a number of cities countrywide this year. 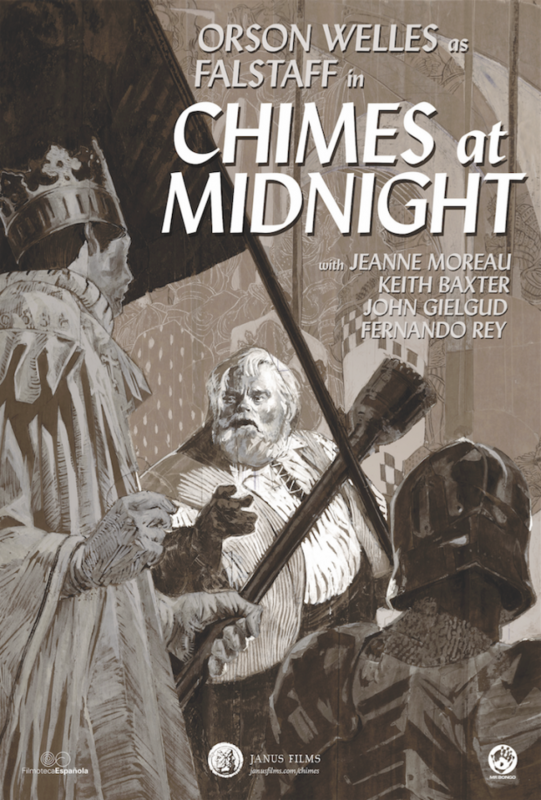 Chimes at Midnight was the Welles’s final completed narrative film. Fooling his financiers in thinking he was making a film adaptation of Treasure Island, Welles went ahead and combined sections from both parts of Henry IV and The Merry Wives of Windsor, with smatterings of Richard II and Henry V. Welles plays Falstaff, the gregarious provocateur and surrogate father to the wayward Prince Hal (Keith Baxter), shirking his duties as heir to Henry IV (John Geilguld). Welles’s Falstaff is bigger than life and bigger than the screen that confines him. Looking like Santa Claus, Falstaff is a perpetual Peter Pan and cannot cope with Hal’s accession to the throne. A nice counter-point to Falstaff is Geilguld’s stoic Henry IV. The often forgotten Keith Baxter gives an understated performance that can be overlooked when next to the boisterous Falstaff. 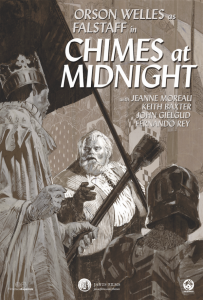 Chimes at Midnight might not be Welles’s smoothest film — the uneven editing tries to hide audio dialogue replacement irregularities — but its imperfection lends to the evocative fairytale dreamland created by Welles and cinematographer Edmond Richard. Streaks of light and fog fill this land of peasants, prostitutes and royalty without reason. The world becomes tactile in its exaggerated form of medieval archways and courts in the King’s castle perforated by heavenly light. The camera rubs noses with the actors to catch the ticks in their eyes and twitches of their mouths; you almost can reach up and twist the tip of Falstaff’s nose. The showpiece of the film is the battle of Shrewsbury where the two armies clash in the thick of fog and wrestle in the muddy fields. The resourceful Welles had a handful of extras play soldiers on both sides of the warring factions. The results looks like an epic battle between thousands. From the larger than life battle scenes to intimate moments between friends, Welles shows off his genius for story and mastery of cinema. The young wunderkind from Kenosha, Iowa had turned fat and started to grey by 1965, but Orson Welles never lost his playful eyes, boyish charm or ability to wow. Chimes at Midnight is a testament to an artistic survivalist and a statement to the world then and now. Great art and artists will always find a way.